Autumn loveliness is upon us and a fresh new singing term has begun! 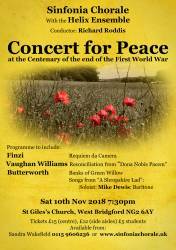 We are working towards our Concert for Peace, with the wonderfully talented Helix Ensemble, which will take place on Saturday 10th November at 7.30pm at St Giles’ Church, West Bridgford, NG2 6AY. 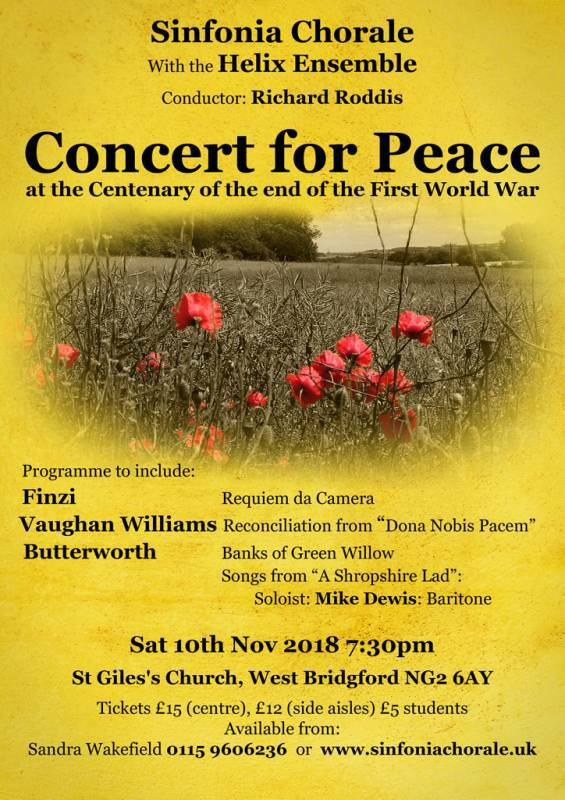 This will be an evening of British and European music, celebrating the end of WW1. As part of this concert, we will also be lucky enough to enjoy the dulcet tones of Mike Dewis, baritone, and the excellent harp playing of Heloise Davies. Gerald Finzi’s Requiem da Camera (1924) will be one of the main pieces of the evening. Using texts by Masefield, Hardy and Gibson, this emotive work reflects on a past English bucolic idyll, which so sharply contrasts with the sadness of war and the loss of all the men who had worked those fields. Finzi’s elegiac style portrays the transient nature of life, through evocative melodies, clashing choral moments, and sudden rhythmic and pitch shifts for emotional impact. Having lost his father, his teacher (Ernest Farrar) and his three brothers during his youth, perhaps it comes as no surprise that Finzi’s music can be so heartfelt in its exploration of difficult themes. We will also be performing Reconciliation from Ralph Vaughan Williams cantata Dona Nobis Pacem, part of which was written in 1911 and the remainder in 1936. This movement sets to music the poetry of Walt Whitman. The Choir, at points, echoes a baritone soloist, whilst the melodic, sweeping strings add to the emotional texture. This plea for peace leaves us with a striking image of bending over an open coffin to kiss the white face of the ‘enemy’, who, according to the narrator, is ‘a man divine as myself’. Vaughan Williams and Finzi were friends, and another connection in our programme is that between Finzi and Ivor Gurney, whose piece Since I Believe in God the Father Almighty (1925) we will be performing. Finzi and his wife, Joyce Black, did not meet Gurney but catalogued and edited all of his works. He studied under Stanford (who also taught Vaughan Williams) but suffered from mental health problems (bipolar disorder) and was also gassed during the war. He spent the last fifteen years of his life in psychiatric hospitals but, despite all of his struggles, he produced hundreds of poems, over three hundred songs and some instrumental music. The image of the ‘tortured artist’ seems particularly relevant here. The motet which we will perform is for unaccompanied double choir, with words by Robert Bridges. An ambivalent relationship with God is explored - the writer believes in God but questions how anyone can know, or understand, Him. This possibly touched Gurney very deeply, as he struggled in his ‘hours of anguish and darkness’, wrestling with ideas of God, beauty and freedom. The image of the ‘tortured artist’ seems particularly relevant here as the music definitely seems to reflect inner struggles, with its haunting melodies, clashing chords and tonal jumps. Another treat for tenor, choir and orchestra is the Vieille prière bouddhique, a work by Lili Boulanger (who died in 1918 at the age of twenty-four), composed between 1914 and 1917. The text, a ‘prayer for the whole universe’, is an excerpt from the Buddhist Visuddhimagga, translated into French by Suzanne Karpelès, and takes the form of an Eastern incantation, utilising solemn chanting and humming, flute and tenor solos and ending with a grand, almost operatic flourish. Boulanger weaves voices and orchestra together, using some clever counterpoint, and she creates mysterious, hypnotic effects, with harmonic changes producing exotic tones. Songs published in 1911 by George Butterworth, setting some texts from A. E. Housman’s collection of poems, A Shropshire Lad (1887), completes our varied programme. Butterworth, who was also good friends with Vaughan Williams, was shot by a sniper in 1916 and this fact enhances the poignancy and tragically prophetic nature of some of the pieces. These lyrical and emotive songs are not to be missed. The evening is sure to be a moving and memorable one, and it would be lovely to see you all there. on the door (subject to availability). They are priced at £15 (centre), £12 (side aisles) and £5 for students. We appreciate your support and wish you a happy Autumn!